Imagine living in a world of complete darkness where your only stimulation is the constant noise of crying and yelling and the occasional elbow in the ribs as another child crawls over you in the communal playpen… That is what life is like for Andrey. Andrey is four-years-old. He has sandy blond hair, gorgeous blue eyes and two of the yummiest cheeks you have ever seen. He is also blind. Sometimes I think that blind children are the ones at the greatest disadvantage in an orphanage. 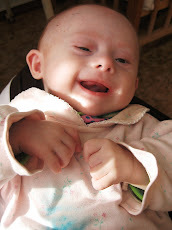 Right from infancy, babies in the orphanage are not held. They are rarely given the opportunity to listen to music. The only stimulation they receive is what they see as they look around their room, watching the other children, etc. But what about the children who cannot see? Theirs is a dark, empty, lonely world. After four long years of darkness, Andrey has withdrawn into his own little world. He spends his days rolling back and forth on the floor as you can see him doing here. He has done this so often for so long that he has a huge bald patch at the back of his head. He does not like to be held. Instead, he receives comfort and stimulation by poking at his eyes and sucking his fingers raw. Andrey was my greatest challenge. He did not like to be held in my arms or sit on my lap and he did not really interact with the toys I would bring. There was one thing that did break through his walls though… he loved to be tickled and would laugh and laugh as I smothered his face with kisses! The sad reality is, blind children are often the last to be chosen. Out of the 500 children that have been adopted through Reece’s Rainbow over the past five years, so far only three of them have been blind. I understand the fear, the idea of not being able to see is a concept that is hard for most of us to wrap our minds around. I myself wonder if/how I could parent a child with severe visual impairment. Then I read the stories of others with visual impairment who are simply living their lives doing most of what I can do and more and I am reminded that blindness is only a limiting disability if you let it be. I worry that Andrey’s visual impairment along with his more significant delays will put him at the bottom of the list when it comes to being chosen for adoption. I so don’t want that to be the case. Even if you’re not being called to adopt Andrey yourself, you can help him find his family by spreading the word, donating to his grant fund and remembering him in your prayers. 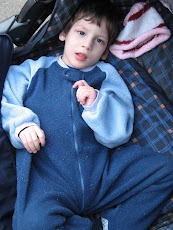 Will you help me make sure this little man has the chance to live a life of joy, meaning and potential? For more information or to donate, click here.